Receiving a choreographic commission from one of the large ballet companies is no small matter. Even favorite children—that is, popular principal dancers—such as Marcelo Gomes, are not assured the resources to do such a thing without providing some kind of proof. Gomes has created a few “pièces d’occasion” for ABT in recent years, including one from two years ago titled Aftereffect, and Artistic Director Kevin McKenzie obviously saw enough to entrust Gomes with more. The result is a major dance of the same title, but with another capital within: AfterEffect, with a painted mural by François Gilot, to Tchaikovsky’s Souvenir de Florence, Op 70, which premiered in the company's short fall Koch Theater season. 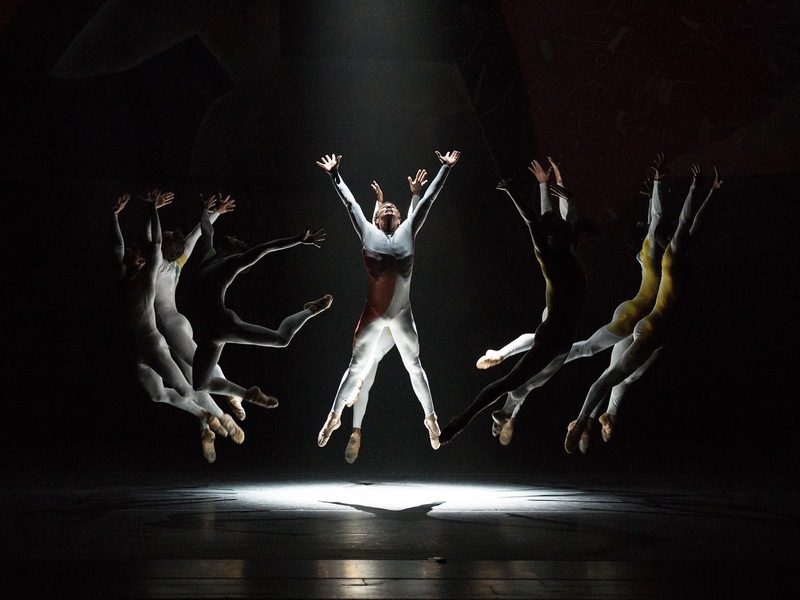 It employs 27 dancers, in Reid Bartelme/Harriet Jung’s color-brushed white leotards and flattering handkerchief skirts. This allegorical dance, with Tudorian part names (The Man, His Loss, His Hope, The Community), is not a radical departure, but it feels substantial enough to merit a recurrence in the repertory. What makes it feel different is its language, which emanates from Gomes’ body. He is among the most beloved of ABT’s current men. He is clearly gifted, but he does not possess great height, stretch, or hyperarched feet, as, say, David Hallberg does. He has maximized his physical gifts, compounding this with superb emotional expressiveness and peerless partnering skills. He has worked extremely hard to make the most of what he has been given. This translates into movement that feels cyclonic, but on a human scale; extensions and spins quickly withdraw, only to lash out again. There is a consistent elegance and plushness—pliés sink deeply, the body twists elegantly in opposition, and even powerful moves ease into place, as we have seen Gomes himself do for years, even in the most persnickety allegro passages. It’s not humorless, though—witticisms include waggling hands and arms that flap like chicken wings. Cory Stearns (Man) ends the first part by jumping up as the lights blackout; the second part opens with him ostensibly landing from that jump. The Man is restless and distant from those nearby. When he is still, the crowd roils around him; he also plants himself downstage to watch the Community bustle about. Cassandra Trenary (Loss) literally flies on with the help of a male gang, dipping to kiss Stearns. Joseph Cirio (Hope) makes a fleeting cameo as well, spinning and imbuing Stearns with some understandable optimism—as in, I can’t wait to see more of his verve and snap in future roles. Gomes handles groups adeptly, and one couldn’t blame him for having taken notes on how Ratmansky moves the corps, nor for noticing his humor and musical treatment. Would I rather see Gomes dance than watch his choreography? Right now, yes. But he holds promise as a dance maker when he hangs up his tights. Joining Justin Peck and Troy Schumacher as an active dancer/choreographer, and one with a huge Prince workload, he should be proud of all the hard work that obviously was invested in AfterEffect. And ABT's spring Met Opera House schedule already seems less populated with Gomes' name, which is sad. All the more reason to cherish his moments onstage when they arrive next summer.